The film, which tells the story of a group of Apple veterans who invented a smartphone-like device 15 years too early, will have its area premiere July 26 in San Jose. AppleInsider and General Magic are partnering up to give away 25 pairs of tickets to the premiere. Find out how to enter today. "General Magic" is a new documentary about the spinoff company in the early 1990s, with several Apple personnel, that created a product that resembled a smartphone. The product and company failed, but its legacy lives on, and its story is compellingly told in the documentary. AppleInsider told you about the film back in May, and debuted the new trailer. Now, in conjunction with the producers of the film, we're giving away 25 pairs of tickets to the Silicon Valley premiere on July 26 in San Jose. 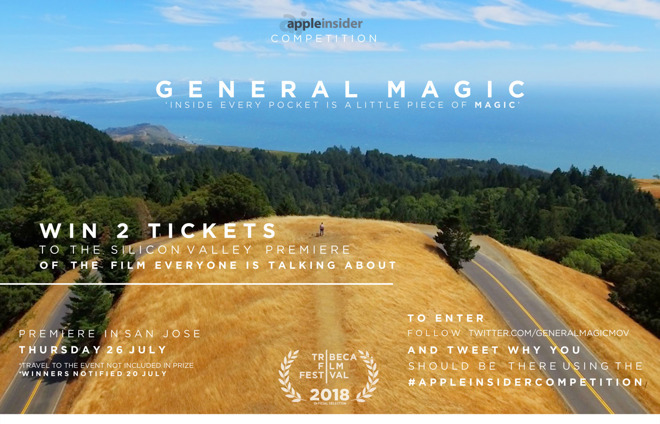 Here's how you can enter: Follow AppleInsider and General Magic on Twitter and send General Magic a tweet about why you want to go to the "General Magic" screening using the hashtag #AppleInsidercompetition. For example: "I want to go to the Silicon Valley premiere of @GeneralMagicMov because... I love old gadgets from the 1990s. #AppleInsidercompetition." General Magic will then pick the best tweets and notify the winners. You have now through July 19 to enter. Note: Prize includes two tickets to the premiere, but does not include travel or accommodations.